Mimicks interactive courses combine a variety of topical discussion & practical hands-on experience, which is an enjoyable, fun and easy way for you to learn. The Face Painting, Glitter Tattoos, Henna Body Art, Hair Braiding and Casualty Makeup course are suitable for individuals seeking a new hobby or interest as well as increasing income on a professional level. The training courses are run on a small group basis and are structured according to experience levels, enabling you to be guided through towards the development of your own personal ability. A Certificate of Attendance is awarded on completion which can be used to acquire your Public Liability Insurance, and accredited qualifications are also available from an awarding body. 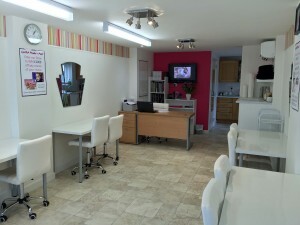 This year we opened our brand-new purpose built training studio - LIPSTICK POWDER & PAINT - in Southampton SO45 2LF. Along with all the courses that you see here we also run VTCT accredited courses in Cosmetic and Media Makeup and Beauty Therapy. Mimicks Face Painting is an elite company with a style that sets them apart from others. Established in 1990, they are one of the leading pioneers of the industry and their vast experience and knowledge will guarantee you first class training in your chosen area. Training is run by Sherrill Church and Ashlea Henson (mother and daughter) who have over 44 years of combined experience in the industry. Sherrill holds all the relevant teaching and assessing qualifications and has taught creative make-up diplomas on a part-time basis at local colleges for 19 years, along with being a training instructor for Capital Hair and Beauty. Ashlea is the internationally recognised instructor who has a following of over 30,000 subscribers to her YouTube channels where she instructs on her step-by-step face painting techniques.